Lewis Hamilton (5th, 1:17.587): "It has been a relatively normal day. As we expected, the Ferraris and the Red Bulls were quite quick and had a little bit more pace than us, so we've got some work to do tonight. This is a tricky circuit and the tyres are overheating; looking after the rear tyres is the biggest issue. The temperatures today and the layout of the track - corner after corner after corner - made it really tricky for the tyres as there's no time for them to cool down. We will do our debrief now and dig deep to try and figure out what changes we make between now and tomorrow. I hope we're able to find something tonight and that tomorrow is dry so we can test whatever changes we make overnight." Valtteri Bottas (6th, 1:17.868): "Today was not an easy day; the car was difficult to drive and I struggled to get laps together, especially in FP1. We managed to improve the set-up for FP2, but there's still more work to do. This is a difficult circuit, you need to have a well-balanced car in order to get all the corners right and we need to get the car more stable. The wind direction is forecast to change for tomorrow, so we need to count that in as well. We struggled to get the UltraSoft compound tyres working consistently and had some issues with overheating. It is difficult to overtake here, so track position is very important and the less stops you can do is always going to be better. Red Bull and Ferrari are as quick as we expected; I think it's going to be very close." 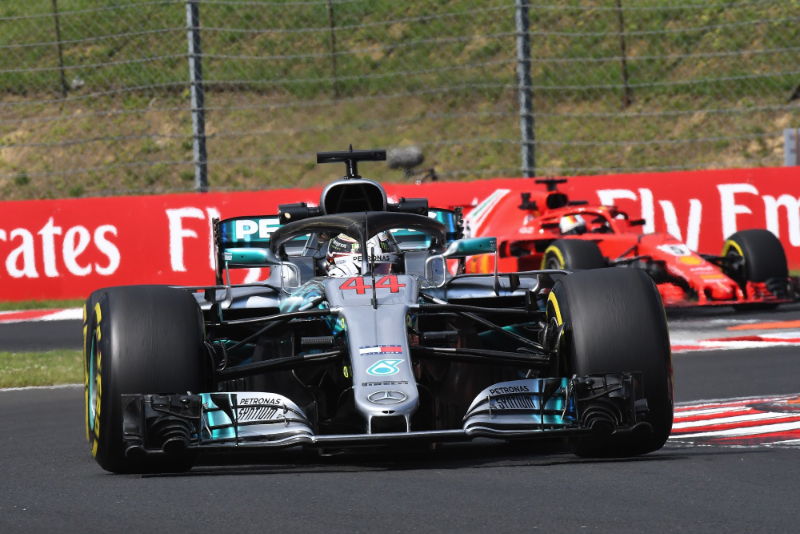 James Allison, Technical Director: "It's not as dusty or bumpy as it was in years gone by, but Budapest always presents a real challenge to the car and driver - searing heat and an asphalt that is not easy on the tyres. Although we managed to improve the car across the sessions, especially with Valtteri, there's more to be done ahead of tomorrow if we want to come home from this weekend with a good result. So we are busy working this evening to try to make sure that we can get the car in good shape for Qualifying on a track where it is notoriously difficult to overtake, while making sure that we have decent long run pace on Sunday when it's expected to be very hot indeed." Max Verstappen (2nd, 1:16.908): "To set a good lap time around this circuit you need a good balance, I felt we have that. The car was good but unfortunately we still lose a bit of time on the straights. I am not sure if the strengths in cornering will be enough to compensate for this, so we shall have to wait and see. I think we can still improve the setup of the car a little bit more and be quicker than our best lap today, if that will be enough for pole position I'm not sure. We are strong in sector 2 as you would expect as it is very tight and twisty. Qualifying will be important as it's hard to overtake here so getting ahead early is vital. Another factor is tyre management and strategy, this will be important come the race so we will look into the data tonight in order to get an understanding before Sunday. Mercedes seemed to struggle on the Ultras a bit but I'm expecting them to get it together tomorrow as they usually do. It is also uncertain how much they gain with their power mode. In the long runs they already looked quite competitive." Daniel Ricciardo (3rd, 1:17.061): "Today was a good day. I think this morning we started well and this afternoon we were also strong, and I think we have a good enough car to be on the front row. Over one lap I think we could still make some improvements, but the long run pace looks good and we're all very close. I predicted that the top six would be tight this weekend, I think come tomorrow this will still be the case. I feel I can still improve my lap time, but so far it was a good start. I think both of the tyres (Ultrasoft and Soft) performed quite well today and even in the long runs they were holding up alright. I would probably say that the Ultras are my preference for tomorrow, but we'll make a plan tonight and then we'll see. Front row would be perfect, second alright, we just don't want to be third row as it's difficult to overtake here." Esteban Ocon (10th, 1:18.761): "It's been a decent day. There is still a lot of work to do before qualifying, but by the end of second practice we were getting close to a good car balance. I always enjoy driving here: the circuit is one of the highlights of the year and every lap makes me smile. It feels really special in a Formula One car and when the car is working underneath you it's really good fun." Sergio Perez (11th, 1:18.850): "It wasn't the easiest session for me, but the most important job was collecting the tyre information, which we managed to achieve. Car balance and confidence are really important here, and we have room to improve before qualifying. I'm not worried if it becomes hotter tomorrow or Sunday because we've done our homework today." Otmar Szafnauer, Chief Operating Officer: "A hot day of work with the middle of the pack closely matched once again. The drivers made good progress bringing the car balance more to their liking during the day and we're well prepared for the weekend now. Given the high track temperatures this week, one of the most important jobs was collecting relevant tyre data because there is the potential for even hotter conditions on Sunday. We've done long runs on all three tyre compounds so that's very helpful for our decision-making and race planning. Our attention tonight will be on trying to find more one-lap performance because qualifying well is especially important for securing a good result on Sunday." Lance Stroll (18th, 1:19.645): "This has been a usual Friday, just collecting data, information and all that sort of stuff. We have been exploring the front wing a little bit and did some work on the rear wing. We were running the same wing as Silverstone, we have looked into it and made some corrections to it, so it seems more stable now. So far it looks OK. I think rain would give us a bit of an opportunity, as without that it is going to be a difficult weekend. I do enjoy this circuit and it is one of my favourites. It is a real drivers' track and you really have to position the car the right way to get a good laptime. It reminds me a bit of Melbourne and those kind of circuits, as there is not a lot of room for error and it is quite a lot of fun." Sergey Sirotkin (20th, 1:19.770): "Both sessions were quite tough today, as expected. I'm still quite calm because we're trying many things. There's quite a lot of work going on with the car so it's normal that some things go better than others. Some things we're spot on with, and others we're still struggling with. It was like that in Germany after the Friday sessions. I knew we had done a good programme and tested many things, but last week didn't feel that good either. Once we looked into everything, the performance was better on the Saturday. I'm quite confident we can do that tomorrow. For now, it's been a productive day and we just have to analyse everything." Paddy Lowe, Chief Technical Officer: "It's been a typical hot day in Hungary, which inevitably makes everything more difficult than normal. There were some thunderstorms around this afternoon which fortunately didn't hit the track, but we expect some may do tomorrow. In terms of the work we've been doing, we've been building on the results we gathered in Germany a week ago and we've done some more testing, particularly in FP1, and found a few more good directions with the new components we've got. We spent most of FP2 learning how to manage the tyres in these hot conditions, ready for the race on Sunday. Inevitably that's going to be quite difficult, but that's the case for everybody. We have plenty to work on overnight to try and find some improvements for qualifying tomorrow, which is very important around here, and perhaps less so for Sunday as overtaking here is more difficult." Carlos Sainz (8th, 1:18.495): "It was good to get out on this track and the car was feeling pretty decent. We ran through the usual programme, and were able to make positive progress. As usual, we identified what we need to do to improve the car and I'm particularly looking forward to tomorrow." Nico Hulkenberg (14th, 1:18.913): "We missed quite a lot of running today, which never helps the cause. We were reasonable out of the box in the morning but the car just shut down with no warning. Once the Energy Store was changed I was able to get out in the afternoon, but obviously my programme was very different from that intended. On the plus side, we were still in the top ten at the end of FP1, so it wasn't all bad. Looking at the other side of the garage there doesn't look to be any major concerns so I'm hoping for a better day tomorrow." Nick Chester, Technical Director: "Nico lost some track time with the Energy Store change, but aside from that it was reasonably straightforward for us. Carlos had a decent day, on the pace in both sessions and with good feedback for us to work on in terms of setup. Nico missed a lot of running today but was on the pace in FP1 and we know that's something he can bounce back from very easily." Pierre Gasly (9th, 1:18.518): "Today was a really good day, I'm super happy to be in Budapest as it's one of my favourite tracks. We had two positive sessions and completed a lot of testing. The feeling with the car was good from FP1 and we certainly have a good baseline for the rest of the weekend, so we need to keep building on this. We just need to stay focussed and hopefully keep the good performance for tomorrow." Brendon Hartley (15th, 1:18.916): "It was a pretty clean day and in general I would say it was a good start to the weekend! It looks like we are definitely more competitive than in the previous couple of races and this is positive. Pierre had a very good FP2 having a small pace advantage on me, so we'll be looking at the different test items overnight to try and maximise everything for tomorrow." Jonathan Eddolls, Chief Race Engineer: "We had a successful Friday here in Budapest covering all of our planned test items. It is a track that suits the characteristics of our car – many low speed corners, fewer long straights - and with higher track temperatures we expected that our competitiveness here should be improved over recent events. In FP1 we had two sets of Soft tyres for each car, so we spent it carrying out setup work. We had a number of interesting test items that came out of the analysis from the previous event, and also items which are specific to this track due to the slow speed nature and the importance of traction performance. So far they are all working as expected. Moving into FP2, we had one car on the Mediums and the other on the Softs for the first low fuel runs before both cars fitted new Ultras; this allowed us to get long run data on all three tyre compounds. The engineers did a good job to improve the balance from FP1 for the first runs, and then tracked the balance change with the track improving before fitting the new Ultras, which for Pierre was a step of three compounds. The difficult task today was tyre overheating, particularly at the rear, with the nature of the track and also the high track temperatures in the mid 50ºC. We managed to control this on the low fuel runs but the longer runs were trickier. Even so, the car is looking relatively competitive over both short and long runs. There is still work to do to the car to optimise the balance, but it's more fine-tuning rather than completely changing the setup window, so we are in a good position for the rest of the weekend." Toyoharu Tanabe, Honda F1 Technical Director: "We tackled our usual Friday programme, including long runs and working on settings. As always at this circuit, the track was quite dusty in the first session and then in the second one, it improved, and as expected temperatures were quite high throughout the day. Fortunately, the rain storm we could see clearly heading towards us, missed the track and we were able to complete our programme. Everything in terms of driveability and cooling, key PU factors at this track, worked well, so overall, it was a positive day, which is encouraging for the rest of the weekend. In tomorrow's free practice we will pay particular attention to qualifying set-up as grid positions are so important at this tight track." Romain Grosjean (7th, 1:18.065): "We did most of our program today. This morning we had a problem with the car and we lost some time in the run, but after that we got the best information we could from the other car and it's been a good afternoon. The gap with P8 on new tires was pretty good to see and in race pace we can still improve a little bit, so that's what we're going to be looking at to get good on Sunday. Our aim is to do as well as we can from now on and look to the future, not the past. We've got 10 more races, so we'll try to make them good." Kevin Magnussen (13th, 1:18.880): "We had a bit of a messy day, but the car is feeling good and the pace is there, so I think we just wait for tomorrow and work on the things that we see on the data, the feedback, and things should be ok. Some days you just have a lot of traffic and we had some wrong switch headings, little problems that keep you from putting the lap time on the board, but still you get a feeling and you get pieces of the data that you can look into and improve from there. We'll do a bit more tomorrow and, hopefully, get a clean session where we can verify the things we're going to change for tomorrow, which won't be much because I think it was okay today. So, we're in a good place. Very happy." Guenther Steiner, Team Principal: "Pretty good day. We had two small issues which we worked through on the cars. Otherwise, there's a little more work to be done, but I think for tomorrow we'll have a good day." Fernando Alonso (12th, 1:18.857): "It's been a positive Friday for us, in terms of the feeling in the car. We did a lot of tests and collected good data, with the morning session focusing more on aero tests and gathering basic information, and the afternoon session about trying out both compounds of tyres. It was quite warm today, with the asphalt reaching as much as 61 degrees Celsius in FP2 I think, which is quite a record! So, let's see tomorrow what we can find. The set-up and balance were not ideal today, as we struggled a little bit with understeer. There is a lot of performance to unlock in the car if we find the right balance. We need to chase the track temperature and track conditions as this is a circuit that always keeps improving with more rubber being laid down by different series running. Tomorrow we'll have a different track and we need to anticipate that." Stoffel Vandoorne (19th, 1:19.717): "I'm happy with how this Friday went. I had a normal feeling in the car, and we could go back working on the set-up of the car again and not just trying to solve problems all the time. Unfortunately, I didn't set any lap-times on the Ultrasoft tyres because I made a mistake and spun off the track. But, our long-run pace looked strong and we're getting the balance much more together. There were significant changes from FP1 to FP2 and we gathered a lot of valuable info to put the car in good shape for tomorrow. I'm looking forward to having a good final practice session and then we can prepare as best we can for qualifying. The target for us is to be as close as possible to the top-ten as I don't know if actually being in Q3 is a good thing, having to start on the Ultrasoft tyres. All-in-all, it was nice to just have a normal Friday." Gil de Ferran, Sporting Director: "Today was a productive day where we were able to complete our test plan, and we saw some positive results come out of it. Obviously, we had to deal with extreme temperatures today, and certainly how people deal with this factor throughout the weekend will play a part in how competitive everyone is. Both our drivers and engineers still feel like there's some room for improvement, however, I would regard today as being as good a Friday as we've had of late." Marcus Ericsson (16th, 1:19.043): "It was a mixed day for me. FP1 was a bit messy, with some spins that damaged my tyres. We could not run as much as we wanted to after that, so it was not the best first session. We made up for it in FP2, where we completed a good number of laps. We have some work to do overnight, and will do our best to optimise for tomorrow." Charles Leclerc (17th, 1:19.137): "Today was a more difficult day. I missed the first free practice, and had some catching up to do during the second session. We have a lot of work ahead of us to get to where we want to be for the rest of the weekend. Hopefully we will manage to take a step in the right direction, and build on our performance from the past weeks." Antonio Giovinazzi: "It was another productive free practice session today – my second one with the team so far this season. It was great to be back in the car after just a week again, and I am starting to get a better feeling for it. As it was last week, my target today was to complete the full programme and give as much feedback to the team as possible. I am happy with this. I look forward to being back in the car for a day of testing with the Alfa Romeo Sauber F1 Team next week."